I have to brag on my dinner last night. Even better, I wasn't sure what I was making until about 6:00 last night -- so this meal goes together quickly and easily. I had split chicken breasts and kale in the fridge and a can of black eyed peas in the pantry to work with. I used this Pinterest recipe for "Man-Pleasing Chicken Thighs" and although the name is a bit silly, it certainly lives up to the hype! The sauce was so easy to put together. In a pinch, I substituted red wine vinegar for rice vinegar. Ian just raved about the chicken. Make sure to spoon lots of the sauce over it before serving! Kale is something I really love the idea of for the health benefits but I just hadn't found a recipe that makes me CRAVE it yet. Well, the day has come. I found the recipe. I bought several stalks last week to toss some into soup but had quite a bit left over. Last night I tore the leaves from the stalks, washed them in a colander, and let them dry a bit. Then they went into a pot with some olive oil in them for a quick saute. After letting them wilt down a bit with the lid on the pot, I seasoned the greens with salt, pepper, and a few splashes of apple cider vinegar. They tasted similar to collard greens and they were absolutely divine! I've been trying to do more with dried beans rather than canned, but last night I went for the can since I hadn't soaked any dried beans. These BEP's were simmered for about 45 minutes on low with some Worcestershire sauce and a few rosemary sprigs thrown in as well as a little salt and pepper. Ian asked if we could have this exact same meal every single Monday night. I can't say that will be happening, but it was a heck of a compliment. We roast kale at our house 3-4 times per week!! Love it! I always love your recipes, and this looks like another winner! I will have to try it. YUM! I shy away from maple syrup since JM's diabetic, but this might be a great change of pace!! Also, since you obviously love mustard (as do I), I've done mustard on kale and it's ridiculously easy and RIDICULOUSLY good. Either Dijon or the grainy kind. I made this man pleasing chicken several weeks ago! It definitely lives up to its hype! So good! Glad you enjoyed it! I'll have to try it with kale and black eyed peas next time. This looks SO good. I hadn't become a kale lover either so I may just have to try this next week. Just pinned this recipe to try next week! I've made this before and it was really good! I want to make it again now after seeing your pictures! Looks delish! The recipe you referenced used thighs and she baked for 40 min. Did you bake your breast for the same amount of time? Thanks for sharing this recipe!! It looks so yummy. I've never cooked with Kale so this would be a good recipe for me to try. 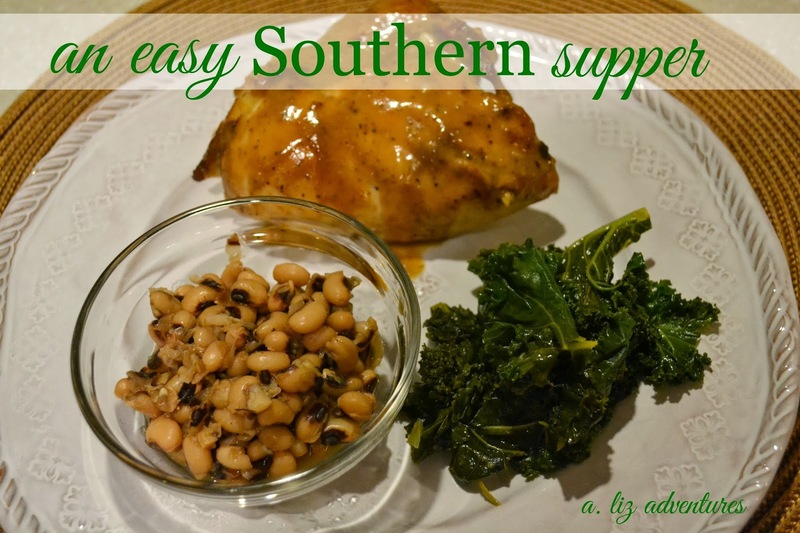 Plus my hubby is crazy about black eyed peas so he'd be thrilled to see this on our weekly menu. Yes, because these were split, I used the same baking time and temperature as the thighs. To check them I used a meat thermometer in the largest piece and made sure they were over 165 degrees. Looks yummy and easy to make...that sounds like a winner to me!!! Yum! Definitely will be trying these soon!